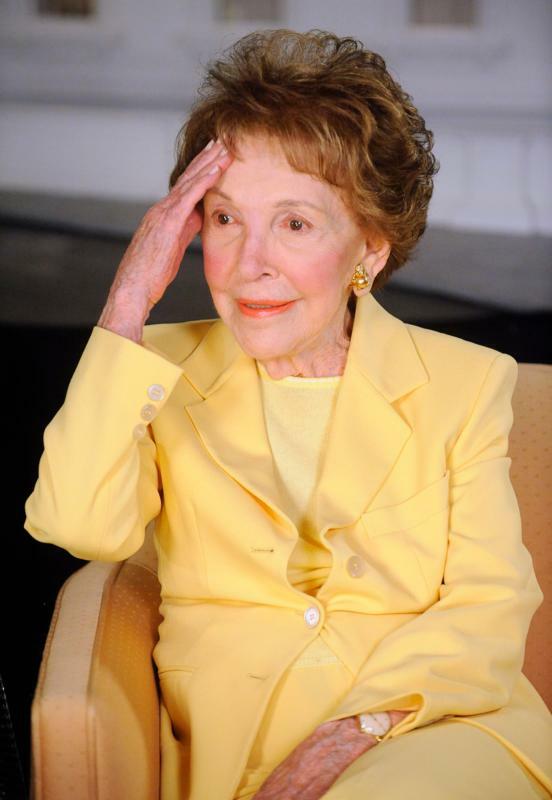 UPDATED – LOS ANGELES (CNS) — Nancy Reagan, who became first lady of the United States in January 1981 following husband Ronald Reagan’s victory in the 1980 presidential election, made her anti-drug campaign a signature effort of her eight-year tenure as first lady. Reagan, 94, died March 6 in Los Angeles of congestive heart failure. Her body was to lie in repose at the Reagan Presidential Library in Simi Valley March 9 and 10, with the public invited to pay their respects. A private funeral was scheduled for March 11. She is to be buried alongside her husband at the Reagan library. Ronald Reagan died in 2004. In a statement March 7, President Barack Obama said that shortly after his own election to the White House, he met Nancy Reagan and he described her as charming and gracious to both him and first lady Michelle Obama. The president noted that the deep love Nancy had for former President Reagan was well documented. “He was lucky to have her and I’m sure he would be the first to acknowledge that,” Obama said. The White House announced that Michelle Obama will attend her funeral. Nancy Reagan’s “Just Say No” initiative became a national catch phrase that extended far beyond the use of drugs. In 1983, she and Washington Redskins football player Mark Murphy visited Bishop McNamara Catholic High School in the Washington suburb of Forestville, Maryland, to warn young people about the dangers of drug abuse. She said drug abuse is “the most democratic of problems” in that all levels of society suffer from it, irrespective of economic or social positions or regions of the country. During her appearance, Reagan questioned why movies and entertainers glamorized drug use. Reagan was made an honorary McNamara mother. Also that year, she hosted a PBS special, “The Chemical People,” to stir awareness about drug use. In 1984, she received the Mother Gerard Phelan Medal, named for the woman who first brought the Religious of the Sacred Heart of Mary to Virginia and founded what is now Marymount University — run by the order — in the Washington suburb of Arlington, Virginia. In 1985, Reagan received the CYO Citation of a National Figure Award at the annual dinner of the Catholic Youth Organization of the Archdiocese of Washington, in recognition of her campaign against youth drug abuse. “I’ve seen young people empty of all that is precious in life. So we must dedicate ourselves to see this emptiness is filled with all the joys and fulfillment that a drug-free life can bring,” she said at a banquet where she received the honor. By this time, Reagan had traveled an estimated 60,000 miles to 44 cities in 24 states to spotlight the problem of youth drug use, according to an article in the Catholic Standard, newspaper of the Washington Archdiocese. She was commended by the CYO for her efforts to promote substance abuse awareness among the nation’s young. In introducing her, then-Archbishop James Hickey praised her leadership in the fight against drug abuse. Also in 1985, Reagan traveled to the Vatican to meet St. John Paul II, who praised her work in combating drug addiction. She also received the ‘Project Man” award from the San Carlo therapeutic community, run by an Italian priest. The week before her Vatican visit, Reagan hosted a White House conference on drug abuse for the first ladies of 17 countries. Reagan also met the pope at an inner-city Catholic school during the Los Angeles portion of his 1987 visit to the United States. In 1986, Reagan received the Cardinal Gibbons Medal from The Catholic University of America, Washington. The highest honor conferred by the university’s alumni association, it is awarded to a person for distinguished and meritorious services to the Catholic Church, the United States or Catholic University. She was selected for her service to the nation’s families in helping to combat drug abuse. Reagan also supported of embryonic stem-cell research in trying to find a cure for Alzheimer’s disease, which felled her husband in 2004, 10 years after he revealed his diagnosis. The Catholic Church does not support embryonic stem-cell research. During a 1983 visit to South Korea, Reagan gave a piano to Seoul Boys Town, an orphanage in the capital. Born Anne Frances Robbins in 1921 in Washington Heights in the New York borough of Manhattan, she was nicknamed “Nancy” at birth. Her father, Kenneth Robbins, was a car dealer who abandoned the family; her mother, Edith, was an actress. Nancy was sent to live with relatives in Bethesda, Maryland, when her mother resumed her acting career. Edith got married again to a doctor and brought her daughter back to live with her and her new husband, Dr. Loyal Davis, who gave Nancy his last name. As Nancy Davis, the future first lady enjoyed a fruitful career in Hollywood as an actress. She co-starred with her husband, whom she married in 1952, in the 1957 film “Hellcats of the Navy,” She also appeared four times on “Death Valley Days,” a Western anthology series hosted by Ronald Reagan. She retired from acting in 1962 after guest appearances on three television series. She is survived by daughter Patricia, son Ronald, and a stepson, Michael. Nancy also is survived by her brother, Dr. Richard Davis. A stepdaughter, Maureen Reagan, died in 2001.